If you’re looking to refurbish your office, it can be difficult to know where to start. It could be that you have a specific look in mind, or you’re overwhelmed with all of the different office styles and choices available. Even if you’re only looking to change a few details in the workplace, making the right decision can still be tough. Considering making office improvements is a good start in itself, as it’s important to take pride in your workplace and mix things up every now and then. It’s a great way to refresh the business without making any major changes such as rebranding or relocating, but still gives that “all new” feeling. Gone are the days of being bound to beige walls, wooden desks and blue office chairs. Now it’s all about creative and unique workplaces, to keep the interest in what can so easily become dull and uninspiring environments. We’ve all seen the articles and features about “the coolest offices in the world” and some of the extreme lengths that companies will go to, to achieve that title. Larger corporations have started to make huge attempts to encourage their employees to spend more time in the working environment, by providing services that cater to their every need. What were once simple office spaces have now introduced high quality dining and leisure facilities, crèches, chill out zones, and in some places even in-house beauty salons and medical facilities. Of course, there’s no requirement for every organisation to incorporate these features, but everyone can take some inspiration. No matter how big or small the space you’re working with is, you can always make the most of it by introducing a more open plan layout. If this means knocking down office partitions, dismantling individual cubes or completely rearranging the desk layout, do it. Not only does an open office layout make the most of the space you have, and can in some cases make the area seem bigger, it also offers employees more room to collaborate. This helps you work towards building a more efficient workforce, with employees who feel like they have more freedom and space to communicate with and work as a team. There’s no better work space than a bright, airy environment. Natural light is proven to make people happier and more productive, which can only be useful when it comes to building an efficient workforce. Ensuring that your office space allows in as much natural light as possible means ditching the shades and creating an overall more inviting environment. After all, it’s important to make your office somewhere that employees are happy and comfortable to spend their days in. 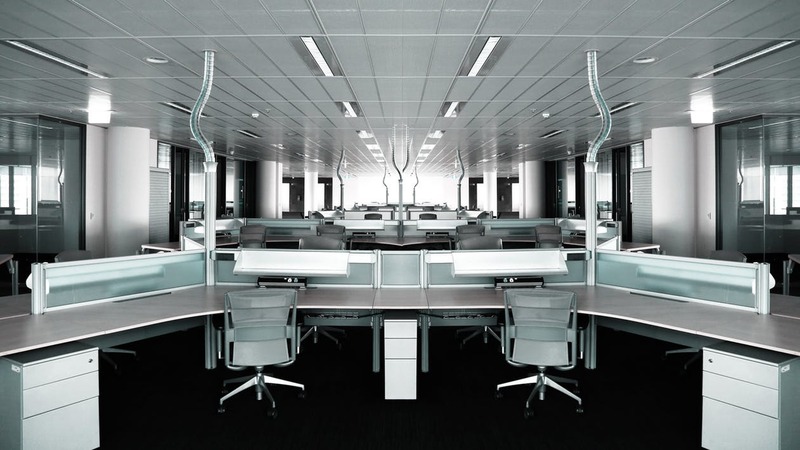 Reducing the need for artificial lighting can also help to lower energy costs in the long run, making more spare cash available to focus on other elements of the office. One of the best ways to keep an office up-to-date with the modern world is by introducing more glass (although we might be biased). We’ve all seen the huge, modern glass-fronted sky-scrapers in city centres and the interior glass elements that compliment. Many offices around the world are picking up on this trend and realising that the more glass, the better. 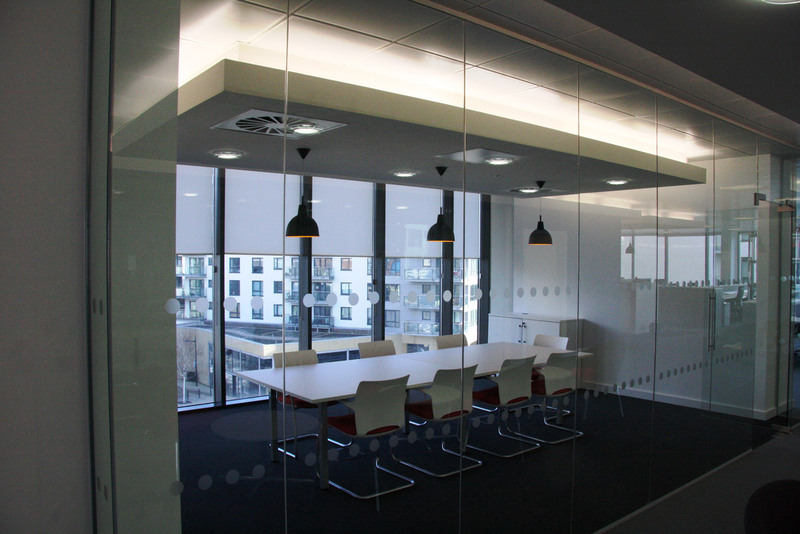 Glass partitioning systems are a great idea for modern offices that want to maximise the amount of natural lighting whilst also creating a more open workspace and keeping an element of privacy. It’s a great alternative to solid walls and doors when it comes to dividing an office and creating private areas for meetings etc. The best thing about glass partitions is that they don’t disrupt the design of an office, and can instead be used to enhance it. Most modern offices nowadays are more than simply a room filled with desks and computers. They realise the need to allow their workers time to break away from the office environment, and have a different space to allow their creative thoughts to flow. A break-out space doesn’t just mean somewhere to chill out and eat lunch, and can actually be used to aid productivity with the chance to work away from the computer. The great thing about break-out spaces is the freedom to design them however you want them to look. There’s no need to keep them as formal as you may design the main office space, and there’s plenty of opportunity to make them as fun and creative as possible for a cooler, more modern environment. You’ve probably heard the news that “sitting is the new smoking” with research proving that sitting for hours on end can be the cause of many common medical conditions. Of course, working in an office 9-5, sitting at a desk for long periods of time is just an expectation of the job. However, in an attempt to combat these health conditions and look out for the welfare of their employees, many businesses have introduced more standing options in the workplace. In demanding jobs, not many workers take advantage of their recommended breaks and don’t take time to stretch their legs. 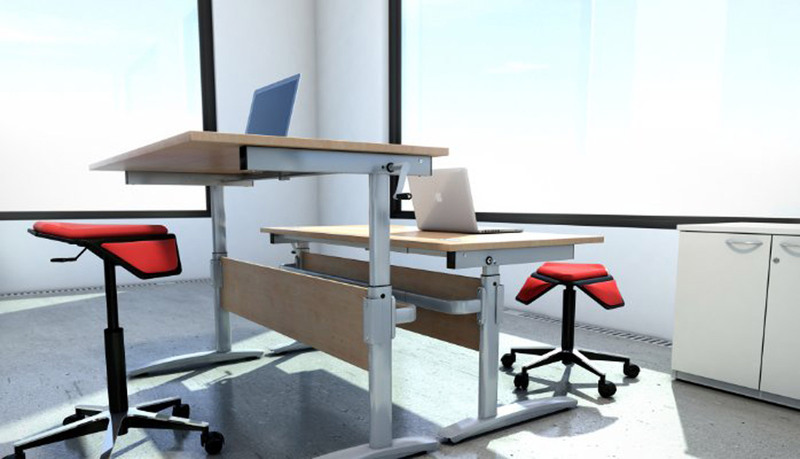 So, sit and stand desks have been created to allow workers the opportunity to get up off their feet, and still work at the same time. They can be quite an expensive option though, so if this can’t be worked into the office redesign budget, it’s worth looking into different standing work stations instead, to get workers away from their desks. When it comes to business, branding is key. You brand your website, advertising, products and more – so why not brand your office, too? Many modern offices splash branding across their workspaces, and focus their primary colours around this too. Branding your office adds visual interest to the area, and can be great for creating feature walls and adding attractive features to the area. Branding the office can be just as important as branding your stationary, although many offices tend to stay clear of it. There’s no need to shy away from having a blown up logo printed onto a wall or frosted on to a pane of glass. It’s your unique logo and branding, and is yours to do whatever you want with it. As with everything, if you buy cheap, you buy twice. Utilise a majority of your budget to invest in good quality office furniture that will last a while. Office furniture is used day, in day out and is inevitable to start showing some wear and tear after time. It’s not something that you want to be replacing every few months, and even when it comes to keeping up to date with modern trends, these shouldn’t need to be changed too often. You might have noticed that the key feature of a modern office environment typically focuses on enhancing the experience for employees. It’s important to ensure that the office is a place they want to be spending their time, so it’s in an employer’s interest to help achieve this. 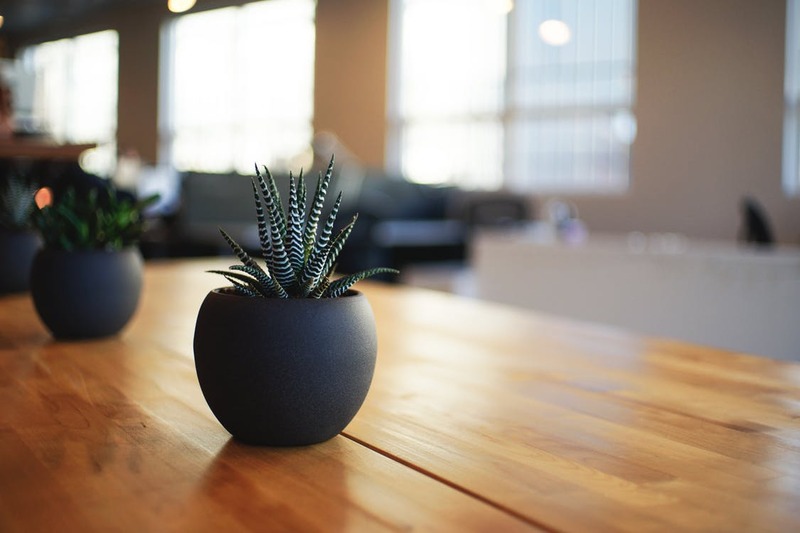 Mood-boosting elements such as plants, nature features, interesting art, office pets and other elements can all help to add to atmosphere in the office and boost the mood of employees. A good mood and atmosphere = a productive workforce (which is what we’re all aiming for). It’s easy to have a million and one ideas about everything you want to be included in your office space, but if you only have a small space to work with, keep it minimal. Utilise the space to include storage space to hide any clutter, to avoid it looking over-crowded. There are some great modern storage and shelving solutions that can be installed to organise any mess and act as a display unit for key items – they don’t just have to be boring cupboards, think outside the box! A small space with many people can quickly become untidy, so enforce some rules that makes sure everyone’s on the same page and all have the same goal to keep the place tidy. Sometimes it really is the smaller things that make the biggest difference. For example, if you’re heading towards a more minimal, clean look, it might just be those few colourful plant pots cleverly displayed on shelving cubicles that really add the finishing touch. The finishing touches are usually what tie the entire design together. So, after investing in the main elements of an office redesign, it’s worth taking time to focus on the small touches to bring everything together in the end. Whether you’re about to undergo an entire office refurbishment, or making some minor improvements, it’s important to remember that the office reflects the company’s image, and can have a big influence on the productivity of employees and impression on visitors. So, get creative and have fun with it! For more information on our office fit outs, get in touch with us here.